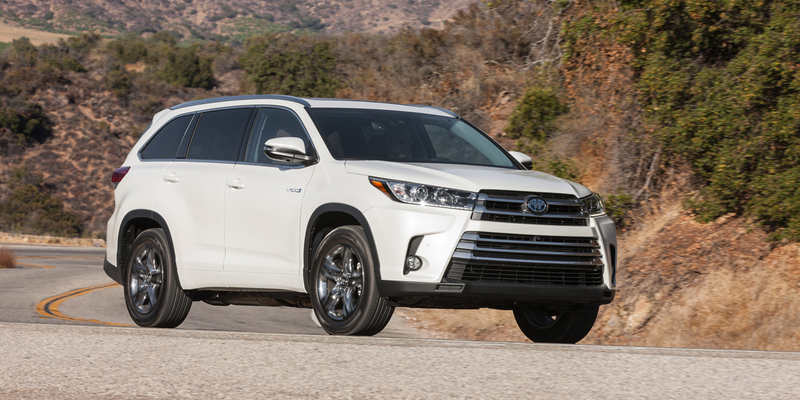 CG Says: The 2019 Toyota Highlander is essentially unchanged with only minor changes to the exterior trim. This midsize SUV boasts a long list of strong points, including excellent passenger room in the first and second rows, flexible cargo space, thoughtful small-items storage spaces, and high-quality interior materials. The available Entune infotainment system offers a broad array of up-to-the-minute connectivity features, and the optional Driver Easy Speak feature, which utilizes the vehicle’s speaker system so front-seat occupants can easily converse with occupants in the third row, is a unique convenience. Available safety features include autonomous emergency braking, pedestrian detection, lane-departure warning and mitigation, and adaptive cruise control. Three powertrains are offered: a 2.7-liter 4-cylinder with 185 horsepower that is paired with a 6-speed automatic transmission; a 295-hp 3.5-liter V6 mated to a 8-speed automatic; and a hybrid that combines a 3.5-liter V6 with an electric motor for a total 306 hp paired with a CVT automatic transmission. The 4-cylinder engine is not available with all-wheel drive. All other non-hybrid models off a choice of front-wheel drive or all-wheel drive. Hybrids are only available with all-wheel drive. Highlander is competitive from a dynamic standpoint as well, offering a comfortable ride and decent maneuverability for its size and heft. As it has been for several years, the Highlander is a must-see vehicle in the midsize-SUV class.